Six years after designing SensAble Technologies first commercially-oriented product, SensAble returned to Bolton Engineering, Inc. to develop the PHANTOM® Omni™. The Omni had significantly different requirements than the original PHANTOM Desktop. The Omni was to be manufactured in significantly higher volumes in the Far East. A Firewire interface would provide a high-speed interface to the PC. With Far East Assembly costs less than one-twentieth of that in the States, Bolton Engineering took a radically different approach to designing the Omni. Instead of using moderately-integrated motor driver Integrated Circuits (IC’s), Bolton Engineering designed the 35W Pulse Width Modulated (PWM) Motor Amplifiers out of discrete components. 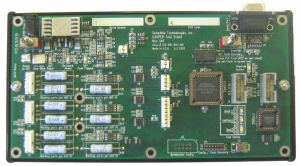 The system was divided into two boards: a low-cost two-layer Power Supply and Amplifier card, and a moderate cost four-layer Logic and Firewire Interface card. An Intel/Altera Field Programmable Gate Array (FPGA) implemented a high-speed interface to a Texas Instruments Firewire Controller and PHY chipset. Leftover FPGA logic was used to create three low-cost 9-bit sigma-delta A/D converters, and three low-cost 10-bit PWM D/A converters. All parts chosen for the design – except for the Intel/Altera FPGA and TI Firewire chips – were sourced and quoted from multiple vendors. Bolton Engineering wrote a Flash memory management system to allow the on-board processor firmware and Intel/Altera FPGA program to be reliably updated in the field. By implementing a multi-bank strategy, the on-board processor never discards the current working programs until after a new download has been completed and verified. Had protocol-demonstration platform working in 4 weeks, and first hardware working in 8 weeks. Completed project in under 18 weeks. Implemented many useful “for free” features in the Intel/Altera FPGA. Beat cost target by more than 2X. Bolton Engineering wrote the specification, designed the schematics, the Altera PLD, obtained vendor quotes, developed the circuit boards, wrote diagnostic software under Linux, wrote the on-board firmware in ‘C’, wrote driver code, debugged the system, assisted with regulatory certifications, and developed a production test stand and test software. The PHANTOM® Omni™. 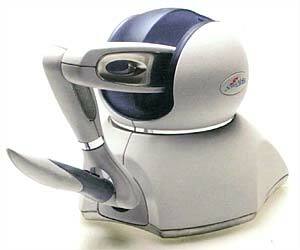 was SensAble Technologies’ second generation commercial haptic device. Just as video screens and soundblasters allow computer users to visualize and hear virtual objects, haptic devices allow users to feel, touch and manipulate simulated objects.